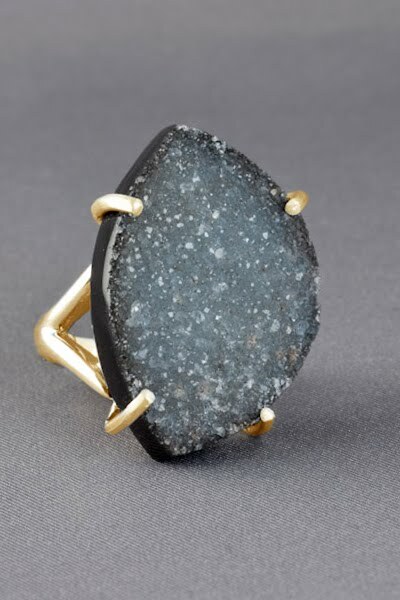 There's something about a raw gemstone that really speaks to me. I love the rough beauty it creates. And upon a finger, whether index or pinky? It's all the rage right now. 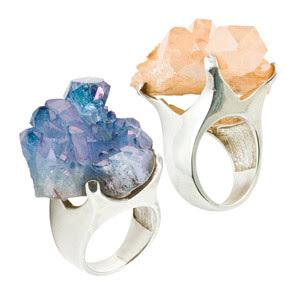 Check out my favorite raw-cut rings. 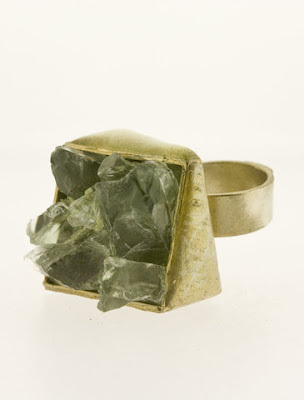 Laura Elizabeth Rachel Ring ($286): Recycled silver dipped in gold lays the foundation for this stunning piece. 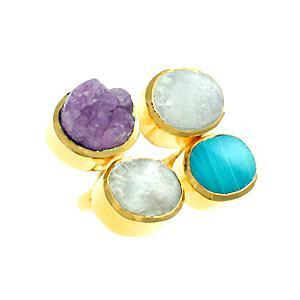 Isharya 18K Gold Plated Amethyst Druzy and White and Turquoise Agate Ring ($80): A rough-cut amethyst druzy surrounded by white and turquoise crystals create such an intriguing silhouette. Can't you just imagine this being the centerpiece of your entire outfit? Monique Pean Pink Tourmaline Ring ($6750): Okay, this is WAY out of my price range. 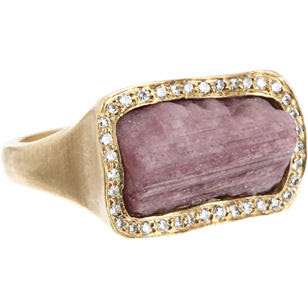 But I am totally lusting after this ring of pink tourmaline and white diamonds set in recycled yellow gold. 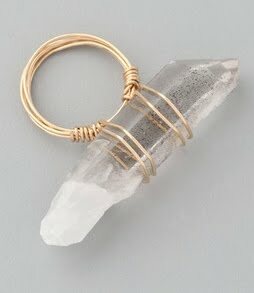 Vanessa Mooney Clear Quartz Wire Wrap Ring ($114): There's something so deliciously organic about a murky unfinished quartz surrounded by tightly wound gold wire. 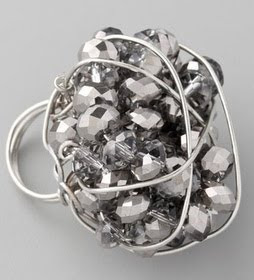 Samantha House Asteroid Ring ($95): Doesn't this just look like a present you're dying to unwrap? I love the misshapen selection of gleaming painted quartz beads. Ken + Dana Design Cyndi Green Amethyst Ring ($145): This handmade ring, crafted from brass and rough-cut pyrite, really speaks to me. It just feels like buried treasure. 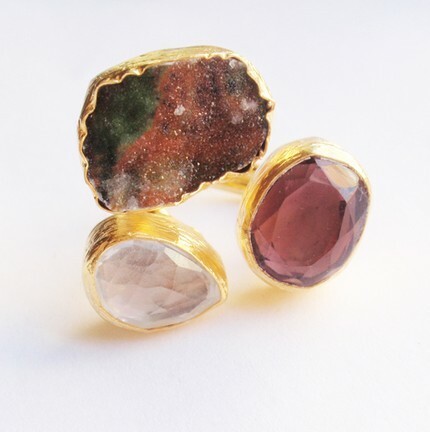 Petra Collection Triple Tourmaline, Clear Quartz and Green Quartz Druzy Gold Ring ($137): A cluster of faceted and roughly hewn jewels, set in textured bezels, makes for a standout cocktail ring. DANNIJO Lucia Mar Cocktail Ring ($575): Whether you choose peach or blue, one thing is for certain -- your hand will be the focus of every event you attend. Wow that asteroid ring is gorgeous. I like the color, the abstract look, but I wish the wires surrounding it looked a little neater. If it was set a little differently it would be perfect.